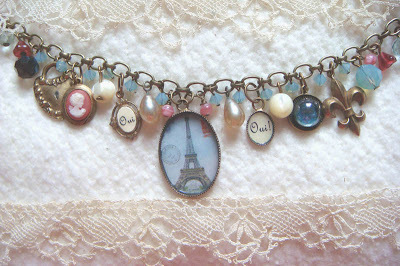 I made this necklace as a positive affirmation of my desire to visit Paris this year. This piece is saying "Yes, Yes!" to Paris! Oui Oui INDEED! I surely hope your dream comes true! Beautiful piece and Happy 50th. It's all good from here on!!!!!!! I love this! Hoping all your dreams come true, PAris would be wonderful! Happy Birthday! Thanks so much for stopping by my blog and leaving such a nice comment. It is so much fun to receive comments and find that so many of us have the same likes. WHEN you go, will you take me? The bracelet is beautiful! I sure hope you get to go, Terri! I've never been, except in my dreams!!! Keepin' my toes crossed for you!!! What a beautiful necklace, hope it is like a lucky charm for you and you go to Paris soon! gorgeous, lovely, such a beauty!!!! !